When the numbers are so high you can’t tell whether it’s the Powerball Jackpot or the pollen count, you know it’s cedar time in Texas. Even as the rest of the country is getting a respite from allergies, we are deep in the misery that is cedar pollen. And yes, if you’re wondering why we’ve been so quiet these last few weeks, it’s because of allergies. 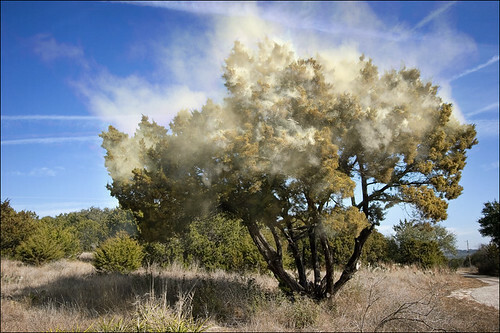 By the way, that tree in the photo is not smoking, it’s releasing pollen. Or as I like to call it, the Devil’s Sneeze. Up close each once of those millions of pollen grains look like this, with lots of little points to latch onto everything in their path – mostly you, your clothes, your hair, they’ll take whatever they can get to make you miserable. Which is why we all feel so wretched when cedar season hits. Not just runny noses and itchy, watery eyes, (not to mention the ensuing sinus infections) but exhausted and achy, too, like getting repeatedly run over by a Mack truck. Driven by Jaws. So if you’re enjoying an allergy free winter somewhere nice (by nice, I mean anywhere that doesn’t have cedar pollen, which means even the inside of a volcano counts as nice), please take pity on us Texans and offer a prayer for our shark ravaged sinuses. This entry was posted in A Nun's Life and tagged allergies, Cedar, pollen, Texas by texasnuns. Bookmark the permalink. Praying you find relief soon, too. Oh.my. I’m native to this part of Texas and have seen this kind of misery around me for years. And yet, I am as confirmed as you that God called you to be exactly here. Psalm 91 gives me comfort and hope when I have a pain. Holy Archangel Raphael intercedes for healing. This is way the last front to hit Houston area fro your direction cause sneezes & runny noses. The Devil’s Sneeze took a huge bite out of both of us. First me, and I was recovering John succumbed. May you find relief soon. Just as there is life after death; there is life after cedar season, and John says that’s nothing to sneeze at.